Notice anything missing from the official Winter Weekend sign? No mention of the Red Sox. What’s up with that? 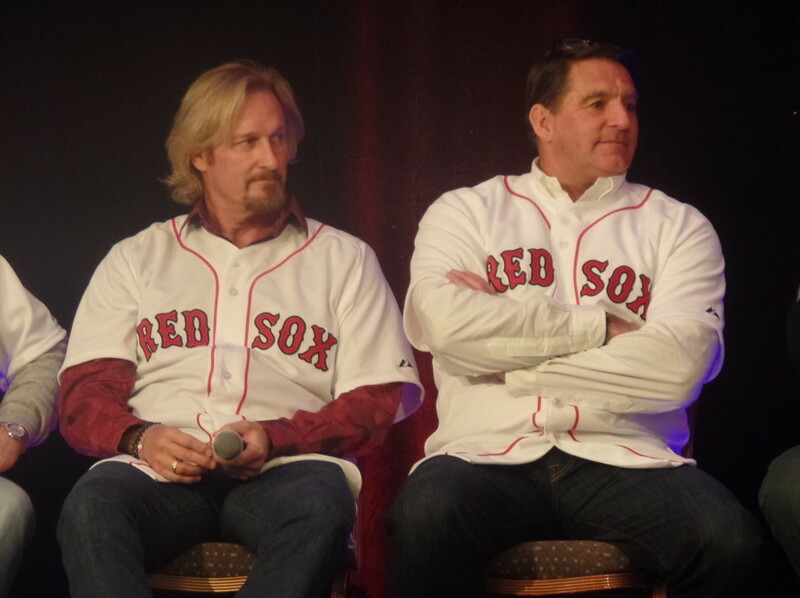 So last weekend was the second annual Red Sox Winter Weekend at Foxwoods. I was at last year’s event and noticed that I didn’t write about it at the time. (I even brought a recorder for the good stuff and still have audio files from that weekend that I’ve done nothing with but listen to them myself.) I am a pathetic excuse for a blogger these days. Anyway, this year’s weekend was loads of fun. I was a little disappointed that there weren’t panels for the minor leagues as there were last year (last year, Kelly O’Connor and I attended almost exclusively panels that covered the minor league players and operations) but the panels we attended this year were informative and entertaining. If I had any doubts about Dave Dombrowski, last weekend erased them for me. (Sure you could argue the team acquiring David Price should have erased them for me but I’m nothing if not stubborn.) The first panel we attended on Saturday was the Baseball Operations update with Dombrowski and Mike Hazen. Two people more eager to discuss baseball operations with the lowly fans you will not find, I promise you. It was less of an update and more of a casual Q&A about the team peppered with some interesting stories from the vault of Dave Dombrowski. I had conveniently forgotten that Dombrowski was the GM of the Florida Marlins when Kevin Millar was getting his start in baseball and last weekend he shared the story about how Millar ended up as a replacement player in 1995. It came up as Dombrowski and Hazen were making that point that regardless of what Baseball Operations folks see in a player, it’s not an exact science and every so often a player comes around that surprises them. Dombrowski was also making the point that some players, the prospects, get special treatment. Kevin Millar was not one of those special players; they didn’t expect him to go anywhere. If I need a specific reason to encourage people to go to the Winter Weekend if the Red Sox offer it next year, sound bites like this one would be my first example. It also doesn’t hurt that Dombrowski speaks relaxed and freely – and is personable enough that you want him to keep speaking. The only disappointment from this panel was that it only lasted an hour. There were other highlights, I got to meet John Farrell and welcome him back, got a picture with Jerry Remy (and my second picture in as many years with my honey Fred LynN! ), we saw Brock Holt giving up his #26 jersey to Wade Boggs at the Friday night town hall meeting, Wally’s little sister Tessie being the belle of the ball all weekend (if I heard one kid scream “THERE’S TESSIE!” I hear ten) and we almost shared an elevator with Roger Clemens (the baseball gods helped me out there and the Rocket ended up not taking the elevator) but they really did save the best for last. The two final panels on Saturday were the Kid’s Press Conference and Red Sox Game Show. The press conference was what you would expect – kids asking the players questions (“What kind of car do you drive? Where is the best burger?”) but the true highlight of the entire weekend was the game show. Three teams (the alumni, the coaches and the players) competed in adorableness like Lip Sync Battle, Celebrity Name Games, Lil Picassos and the Doo Doo game (where you have to sing a song only singing “doo-doo”. It was a ridiculously entertaining way to end the day and it gave us the chance to see these guys more relaxed than we’re used to seeing them. Fred Lynn especially stood out as being a bit more silly than I would have expected. Steve Lyons was exactly as you would think he’d be and Hanley Ramirez completely won over the room with his huge smile, infectious laugh and the fact that at one point he jumped into the audience and sat with the fans so that he could applaud his own team. As an aside, Hanley Ramirez is my binky this season. He completely seduced me last weekend and he has my support because I can’t believe someone with that much life and happiness in him can be bad. Truck Day is February 10th – my plan is to be there because if I know anything it’s that I’m itching for some baseball and this weekend taste has me hungry for more. The entire weekend was a great way to get excited for the upcoming season but now I just want more!